Carriage style garage doors are a great choice if you want a beautifully styled garage door without going the expensive custom garage door route. They offer a very unique look and a wide variety of design options. The carriage doors can also be custom-painted to match your existing home or building. From a distance, they look like a classic carriage house door, but they are modern overhead doors that can be integrated with state-of-the-art wifi-enabled garage door openers. Aladdin Garage Doors is a full service garage door company serving the Houston area. We specialize in the sales and installation of Carriage House styled doors from Clopay and Amarr. Our team of door experts can help you choose the right carriage house garage doors for your home or building. Call 281-252-3346. Carriage house style garage door repair. The carriage house garage doors that we sell and install can be accented with decorative and stylish hardware. A wide assortment of hinges, straps, handles, locks, clavos (sometimes called door studs), and knockers are available to match any architectural or decorative styling on your home or other building. 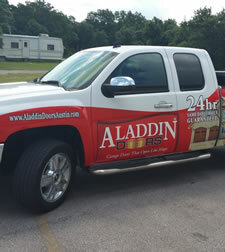 Why Choose Aladdin Garage Doors Houston? When you choose Aladdin Garage Doors Houston, you are working with a small, local, family-run company. We’re large enough to serve all of your door services needs 24/7/365, but we’re still small enough to treat you as if you were our only customer. We make sure you’re 110% satisfied with our garage door repairs and all our services. Call 281-252-3346 or fill out our contact form to receive a free estimate to install carriage style garage doors in your home or building. "Mr. Mark was very professional and courteous I appreciate him being on time and helping me understand my garage and offering different options for me! Thanks Mark, book him TODAY!!"